When J. Empson named Florence Crittenton in his will in 1926, he probably had difficulty imagining that over 90 years later, families would still benefit from his generosity. By setting up a trust, Mr. Empson has ensured that we receive a check every month for the past 92 years representing our share of his estate. What could have been a single gift of only a few thousand dollars became a gift of over $300,000 over time! He has provided care to literally thousands of young families over the years. Mr. Empson’s gift is the perfect example of what a little planning can do. He wanted to find a way to help that would go beyond his lifetime, a legacy. His legacy lives on in generations of families all over Montana. Giving a charitable contribution through your will is an excellent way to leave a lasting imprint. Making a bequest is easy – simply name Florence Crittenton Home and Services as a beneficiary of your estate. I, [Full Name], give, devise and bequeath to the Florence Crittenton Home and Services located in Helena, Montana, the sum of ________ dollars (or ______percent of the residue of my estate or other personal property appropriately described) to be used as its Board of Trustees shall deem advisable to best promote the Florence Crittenton’s objectives. Instead of selling stock, you can give your stock to Florence Crittenton and receive an immediate charitable tax deduction. Charitable gifts of cash to Endowments are also eligible for great charitable tax deductions. Plus, the annuity can make annual retirement income payments to you for the rest of your life. Florence Crittenton can work with you and your estate or tax planner to ensure proper documentation and tax credit for donation. 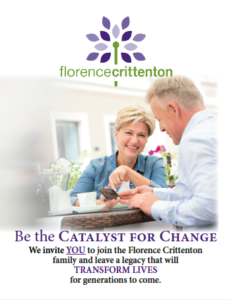 Naming Florence Crittenton as a beneficiary of a life insurance policy is another simple way to keep your legacy strong and continue to help serve young families at FCH in the future. If your family is grown this is an excellent option. A gift of real property can significantly reduce your taxes, while at the same time meeting your charitable goals. Gifts of property can be used directly by FCH, used as collateral for expansion projects, or sold for cash value for the organization. The IRA Charitable Rollover law allows individuals 70½ and older to transfer up to $100,000 from their individual retirement accounts directly to a qualified charitable organization without being subject to income taxes on the distribution. You must be age 70½ or older at the time of the gift. This opportunity applies only to IRAs and not other types of retirement plans. You can transfer up to $100,000 directly from your IRA. The gift can satisfy your annual minimum distribution. You do not have to donate your entire annual distribution to the non-profit, making this a great option if you would like to keep some of the funds each year. You transfer the funds outright to one or more qualified charities. The legislation does not permit direct transfers to charitable trusts, donor advised funds, or charitable gift annuities. 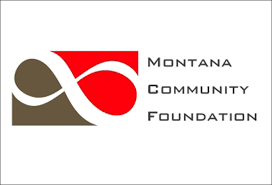 Visit the Montana Community Foundation website for great articles and resources for making Planned Gifts.